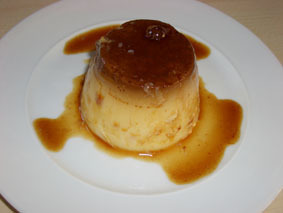 In almost every Spanish restaurant you'll find "Flan casero", home made Caramel Custard on the menu. Flan is a bit complicated to prepare, but it's well worth the effort. 5 tablespoons sugar for the custard and about 1/2 cup sugar for caramelization. Start with the caramelized sugar: Pour 1/2 cup of sugar into a frying pan. Heat on low temperature, stirring constantly until the sugar has melted and is golden brown. Do not burn! Heat the oven (325° F - 175° C). Cook the milk with the cinnamon stick and vanilla pod and make it boil, remove from heat. Beat the eggs and 5 tablespoons sugar in a separate bowl. Add a few drops of lemon. Remove the cinnamon stick and vanilla pod from the milk and add gently the milk to the beaten eggs and stir. Pour the custard mixture into the mold/molds. Set the mold/molds in water (water-bath), the water should cover more than half of the mold and cook in the oven for about 30-40 minutes until the custard mixture has set. Try by inserting a knife, the custard is done if the knife comes out clean. Let the flan cool, and turn flan into a plate before serving it.